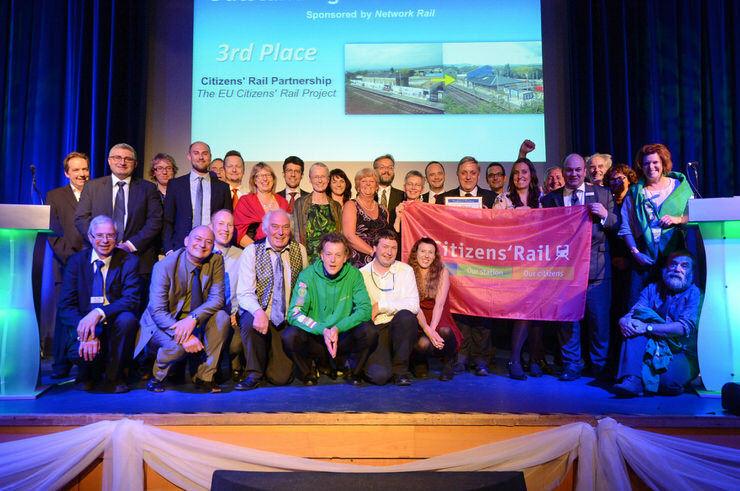 Citizens’ Rail was a triple winner at the UK’s national Community Rail Awards held in Torquay last week. 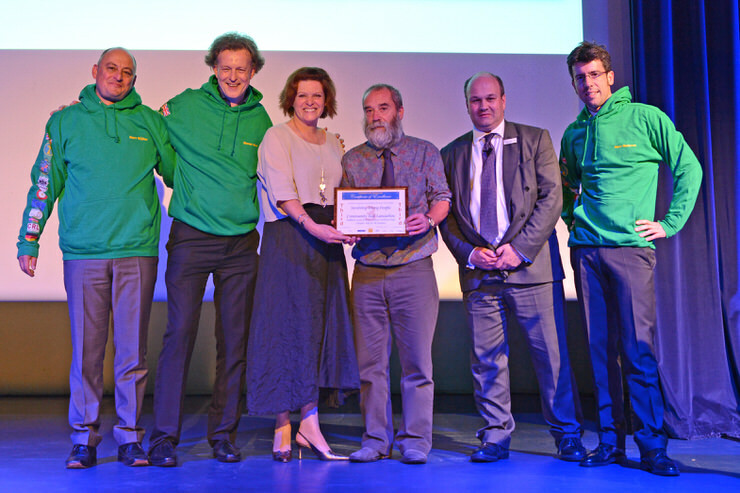 In front of an audience of more than 330 rail industry staff and volunteers, the Citizens’ Rail project as a whole was recognised in the Outstanding Teamwork category. Our UK, French, Dutch and German partners were awarded third place thanks to their dedication to transnational working and delivering imaginative, collaborative projects that went beyond the original scope of the project. These included a once-in-a-life-time trip for Lancashire school children to visit the cathedral school in the German city of Aachen, student masterclasses that helped young people’s ideas to be implemented by the rail industry, and even the donation of Dutch tulips to brighten station gardens in Devon. 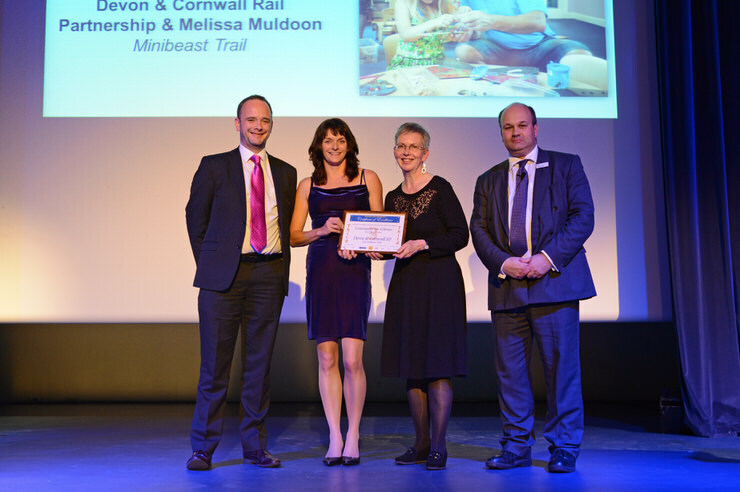 The Devon & Cornwall Rail Partnership’s family-friendly Minibeast Trail on the Riviera Line between Exeter and Torbay was awarded third place in the Small Community Art Schemes category. Working with artist Melissa Muldoon, pupils from Gatehouse Primary School in Dawlish and the Sure Start Dad’s Club Stay and Play in Teignmouth made sculptures of butterflies, dragonflies, bees, ladybirds and snails from recycled plastic. They were displayed on planters at Teignmouth, Dawlish, Newton Abbot, Torquay and Paignton stations. The “Distance Between” project by our Lancashire and Aachen partners also won third prize in the Involving Young People category. A class of primary school children from a former Lancashire mill town were asked to get involved in the opening of Burnley Manchester Road station as part of Citizens’ Rail. They did so in great style. As a result, the class took part in a cultural exchange taking them to Aachen and Heerlen. Many of the children had never been out of Lancashire before. They spent time working with a class of German school children producing artwork now displayed at stations in Lancashire, Aachen and Heerlen. The Community Rail Awards is an annual event organised by the Association of Community Rail Partnerships which celebrates the work being done to promote and enhance Britain’s local and rural railways. 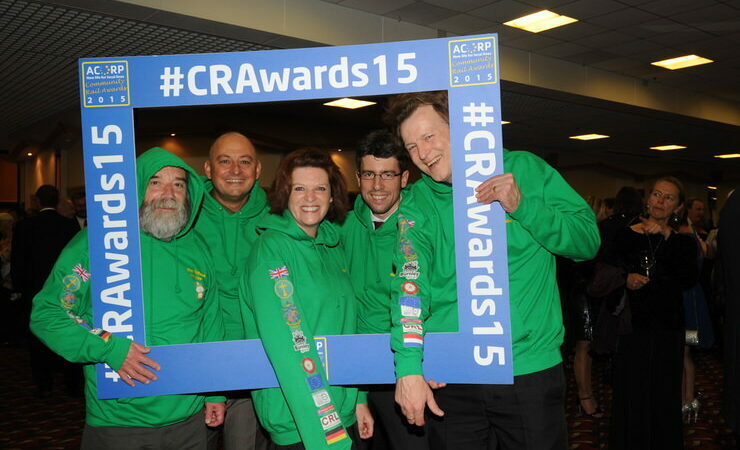 The awards ceremony followed Citizens’ Rail’s final conference held earlier the same day – read more.